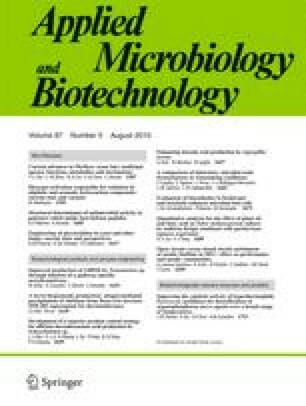 Prolidase isolated from the hyperthermophilic archaeon Pyrococcus furiosus has potential for application for decontamination of organophosphorus compounds in certain pesticides and chemical warfare agents under harsh conditions. However, current applications that use an enzyme-based cocktail are limited by poor long-term enzyme stability and low reactivity over a broad range of temperatures. To obtain a better enzyme for OP nerve agent decontamination and to investigate structural factors that influence protein thermostability and thermoactivity, randomly mutated P. furiosus prolidases were prepared by using XL1-red-based mutagenesis and error-prone PCR. An Escherichia coli strain JD1 (λDE3) (auxotrophic for proline [ΔproA] and having deletions in pepQ and pepP dipeptidases with specificity for proline-containing dipeptides) was constructed for screening mutant P. furiosus prolidase expression plasmids. JD1 (λDE3) cells were transformed with mutated prolidase expression plasmids and plated on minimal media supplemented with 50 μM Leu-Pro as the only source of proline. By using this positive selection, Pyrococcus prolidase mutants with improved activity over a broader range of temperatures were isolated. The activities of the mutants over a broad temperature range were measured for both Xaa-Pro dipeptides and OP nerve agents, and the thermoactivity and thermostability of the mutants were determined. The authors thank Rushyannah Killens for helping to construct the R19G/G39E/K71E/S229T-prolidase mutant. We also, thank Saumil Shah from the U.S. Army, Edgewood Chemical Biological Center at Aberdeen Proving Ground for his help with the DFP and p-nitrophenyl soman assays, especially conducting the G39E-Pfprol assays with p-nitrophenyl soman. Support for these studies was provided by the Army Research Office (contract number 44258LSSR).